On the 3rd of May, 2009 I was supposed to be in Kodakarai. It's a small village far removed from civilization. I heard about it from friends in KANS, an organization working for conservation. KANS was going to conduct a medical camp at Kodakarai as the villagers had to literally trek through jungles to reach a hospital. I was a volunteer but I couldn't make it. The guilt was eating me and a Sunday was being wasted without any meaningful contribution from my side. Silent Valley called but when I contacted the forest office there I was told that no transport was available. Disappointment there too. My sister was down for holidays and the children were bored. Through the mist of guilt a place beckoned; Chinnar. I hadn't been there for a while. The Bandipur Awareness Camps ensured that my jungle trips were in that direction since the last few months. I had forgotten about this little jewel of a jungle. We packed lunch and drove off at 11.00; a bit late in the day but nevertheless a trip was on. We crossed the check post into the Indira Gandhi WLS & NP and a couple of kilometers my eyes were popping out. Not because I saw a herd or elephants or some such thing, but because I saw three young men picking up plastic lying on the roadside. Nothing gets my adrenaline flowing like "anti-plastic" drives. I had to get out and meet these young guardians of the forest. 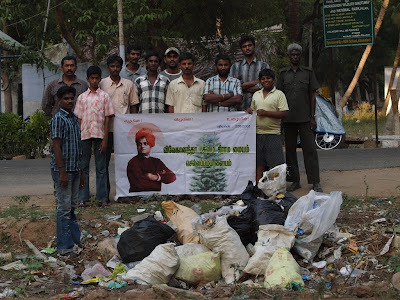 They were from Pollachi and were part of a small group of youngsters volunteering to clear plastic waste from along the Udumalpet-Munnar road. They were doing it in association with the RFO's office in Pollachi. Chinnar was dry. 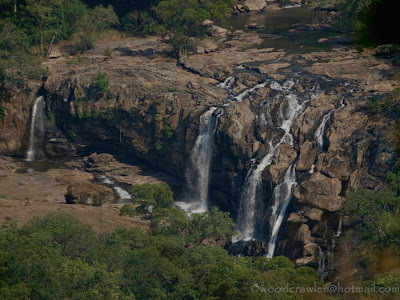 Thoovanam falls were a trickle and the treks were suspended due to fear of forest fires. It was not cause for disappointment. There was work at hand. The weekend crowd were making their contributions and the guard at the Tamilnadu check post was having a field day!! I didn't any more inspiration. By the time the trip was over, the boot of my car was full of plastic waste. My son and niece were the lookouts, their heads poking out of the sunroof searching for abandoned plastic bottles. My sister and me were picking them up and depositing them in the boot. At the Kerala-TN border the forest personnel thanked us for our contribution and the Eco-development Committee members promised to dispose them off properly. As we crossed into Tamilnadu again on our way back we met the group with the RFO. They were carting the waste in the RFO's jeep. I made many friends that day. All between 15 & 20 years old. We have a common cause that we all support. We drove off feeling contented. The Sunday was not wasted after all. 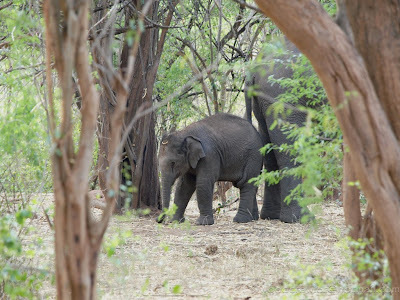 As a bonus, not 30 meters off the road stood an elephant calf and family posing for pictures. A sight I have never seen in Chinnar till today! Is the picture of falling water is of Chinnar? Superb article!!! Keep writing great work!! !